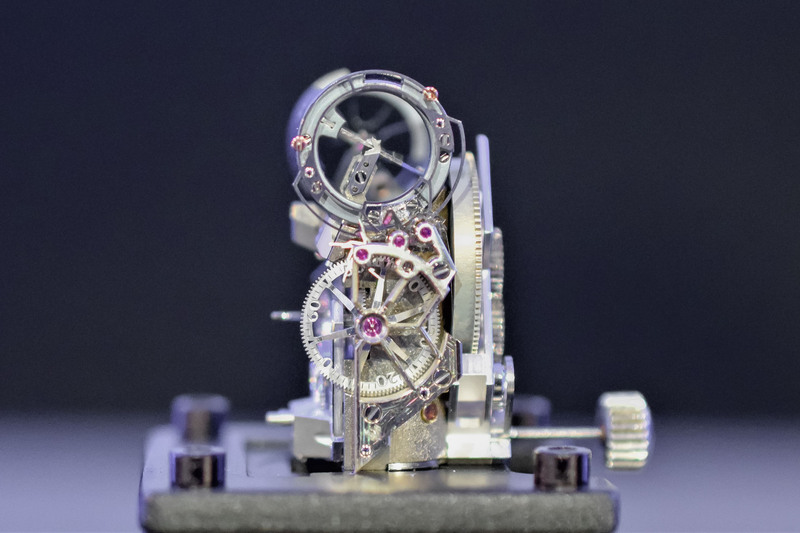 Innovation in the field of escapements and oscillators is the new frontier in technological breakthrough of mechanical watches, as evidenced by revolutionary concepts by Ulysse Nardin, Girard-Perregaux, Parmigiani Fleurier or more recently the Zenith Defy Lab and its mind-blowing oscillator. 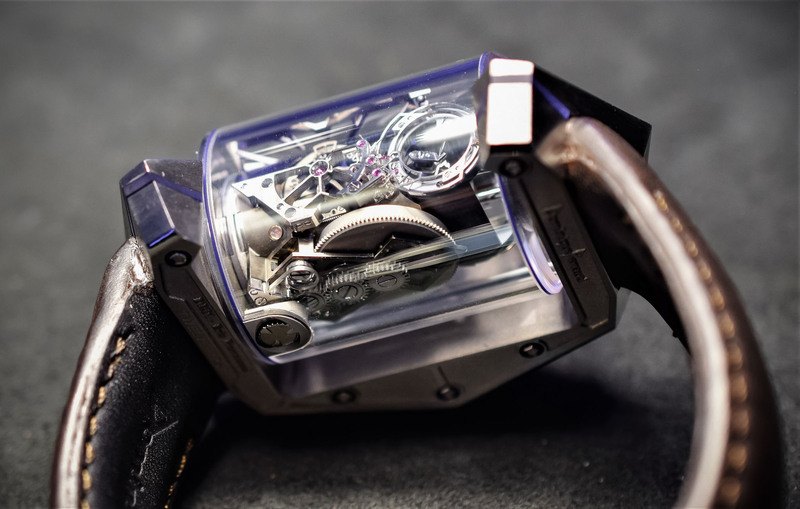 Among these, Dominique Renaud presented an impressive concept dubbed DR01, the first of twelve just before Baselworld 2016. 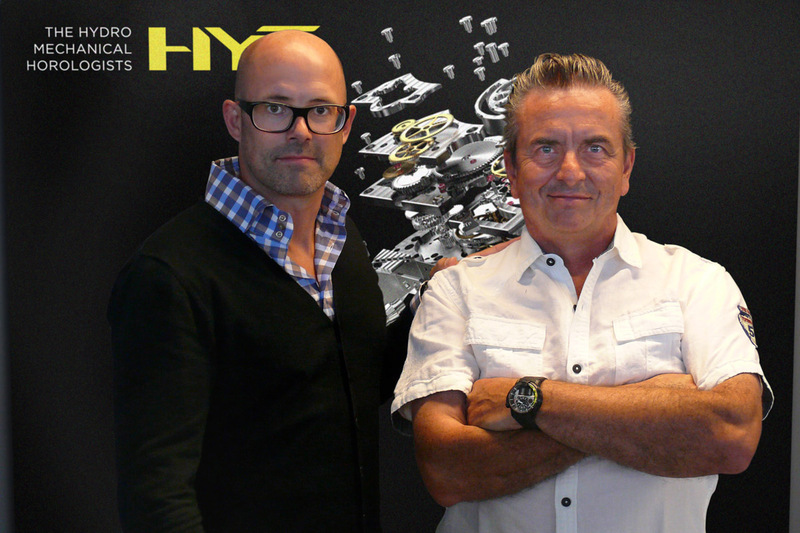 His idea is to manufacture 12 watches (each to be commissioned, personalized and priced at CHF 1,000,000), 12 evolutions of the concept to reach a fully developed version. It is now time for the horologist to unveil the progress made with this development and introduce the first watch in this series of twelve. 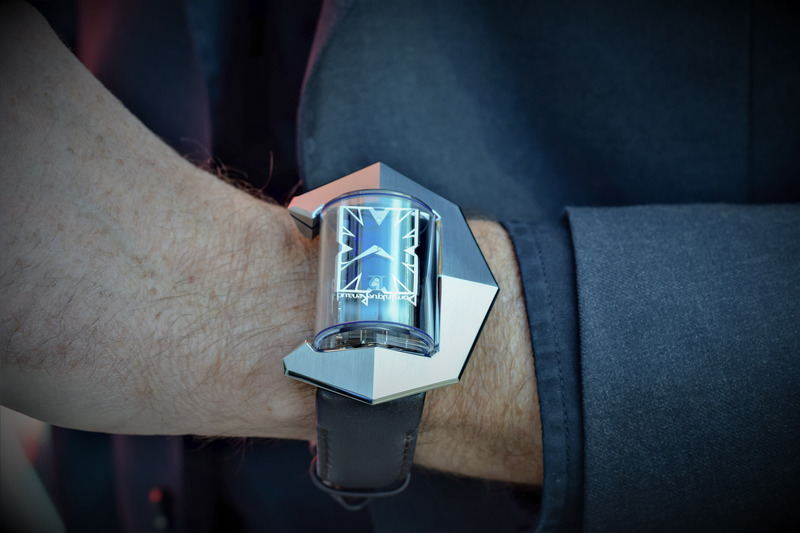 Monochrome reports from Geneva where Dominique Renaud is exhibiting his project and the first watch in the series of 12. 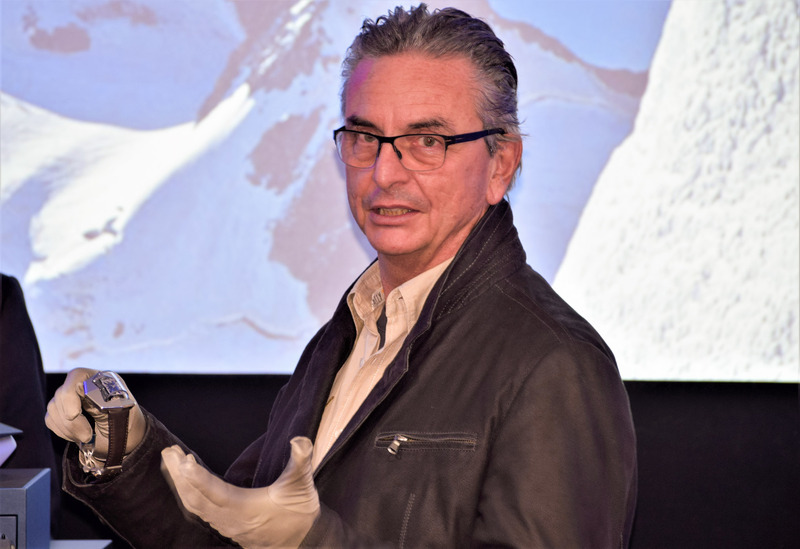 A veteran of the Swiss watch industry, Dominique Renaud is known for founding some 40 years ago Renaud & Papi (now Audemars Piguet Renaud Papi – APRP) together with Giulio Papi. 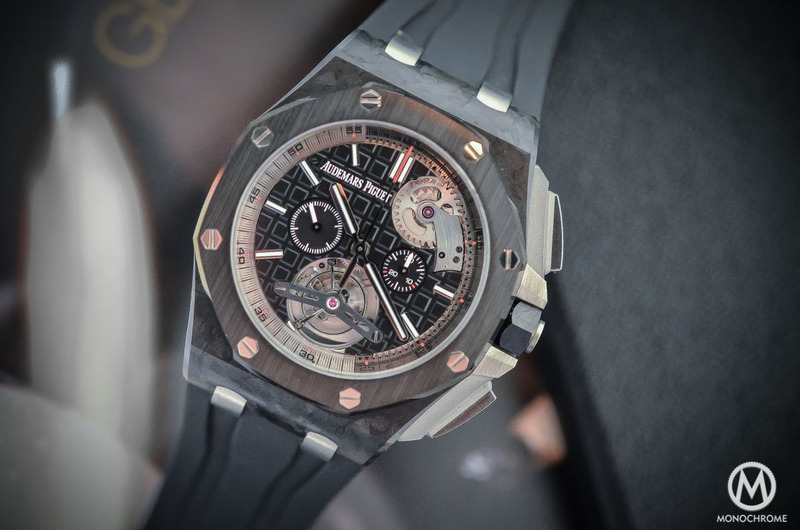 Beyond their work for Audemars Piguet, APRP is one of the most prominent players in the development and manufacturing of complicated movements: tourbillons, chronographs with tourbillon, minute repeaters and other marvels for some of the most prestigious brands. Dominique Renaud left Renaud & Papi when it was taken over by Audemars Piguet in 2000, and retired in the South of France for over 10 years. 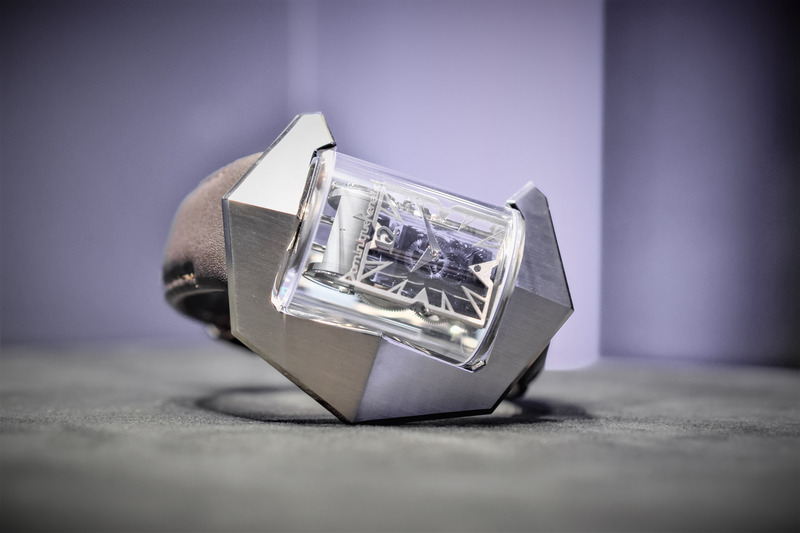 But a few months ago, the watchmaker announced he would be launching a brand under his own name, aiming at ambitious technical developments in the field of mechanical watchmaking. Revising the basic operating principles of the mechanical watch, his DR01 concept integrates a new oscillator, a new escapement and several other noteworthy innovations! A decisive break from the system which has powered the vast majority of watches for centuries: the Swiss lever escapement and sprung balance. The energy (stored by a coiled spring in a watch or a weight for a pendulum) is released in discreet bursts by the regulating organ, which is comprised of an escapement and oscillator. The escapement gives impulses to the oscillator. In return, the escapement is regulated by the oscillator. Each oscillation, therefore, allows the gear train to advance or “escape” a set amount. 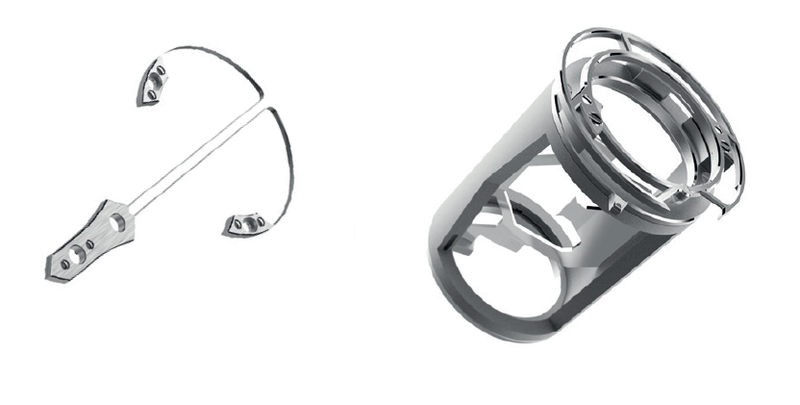 With the DR01 concept, the traditional sprung balance is replaced by a blade resonator, aiming at reducing friction. The hairspring itself is replaced by a crossbow shaped spring, located on the outside of the blade resonator. It pivots between two opposing blade edges, which means with super low friction. As the balance wheel receives an impulse, it rotates in one direction. The tension of the cross-bow spring will then drive the oscillator in the opposite direction and so on. As often with such developments, the idea is to combine low amplitude (30°) with high frequency (5hz for the first piece but it has been tested at 10hz) for increased precision while offering longer power reserve (estimated at over 1 week for the first piece). The important inertia of the system, allowed by the virtual pivot created by the blades’ edge, provides greater stability. This innovative oscillator works in conjunction with an innovative escapement using lost beats. The aim is to avoid perturbing the oscillations of the balance with an impulse at each oscillation. In addition, it also means more power reserve. 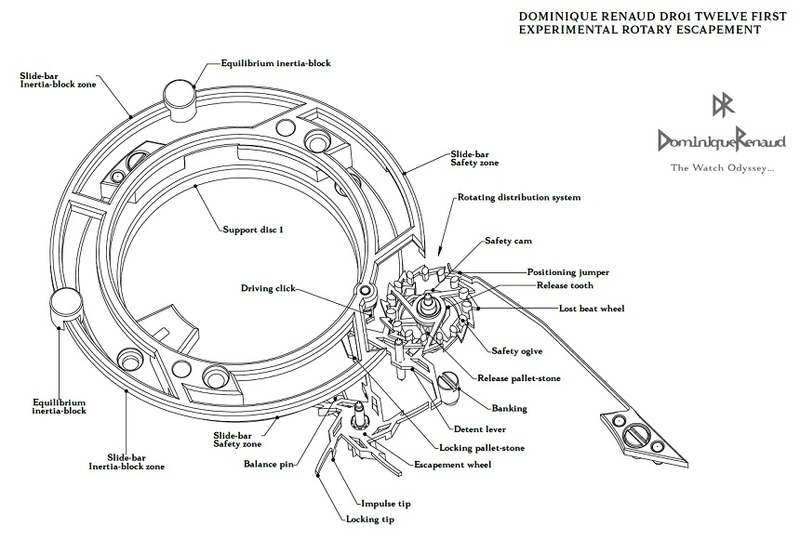 The escapement features a four-level distribution, comprising a lost beat wheel, a ‘scorpion’ detent lever and an escapement wheel, serving to count, control, release and secure. The two-level lost-beat wheel, progresses at each oscillation to unlock the second escapement wheel via the detent only after a determined number of oscillations. This second wheel is then free to give an impulse to the oscillator (1 impulse for ten oscillations in the first version of the DR01 concept). This allows the wheel train and second wheel to mark discrete seconds (one impulse every second) like for a dead-second watch. 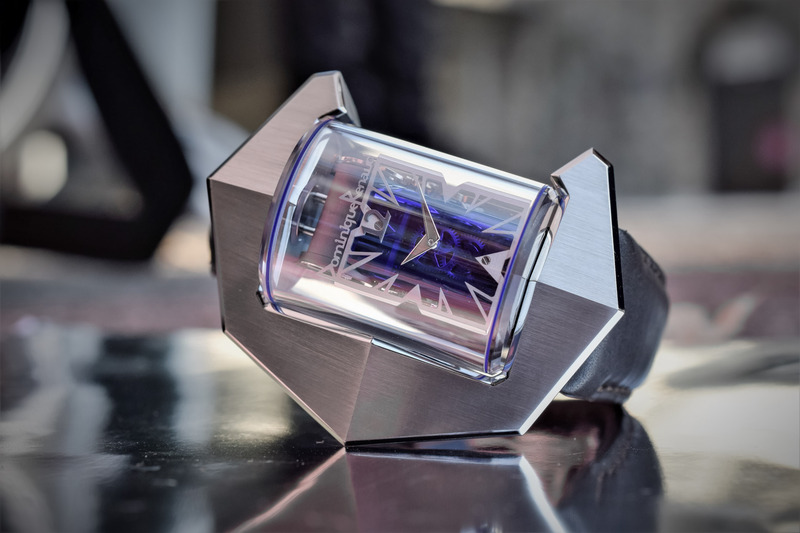 The innovative movement is built on a three dimensional, rectangular engine block housed in a sapphire tube, allowing an unimpeded view of its intricacies. It may look quirky but it is rather impressive as the sapphire cylinder is held within a titanium arch and can, therefore, rotate 360°. 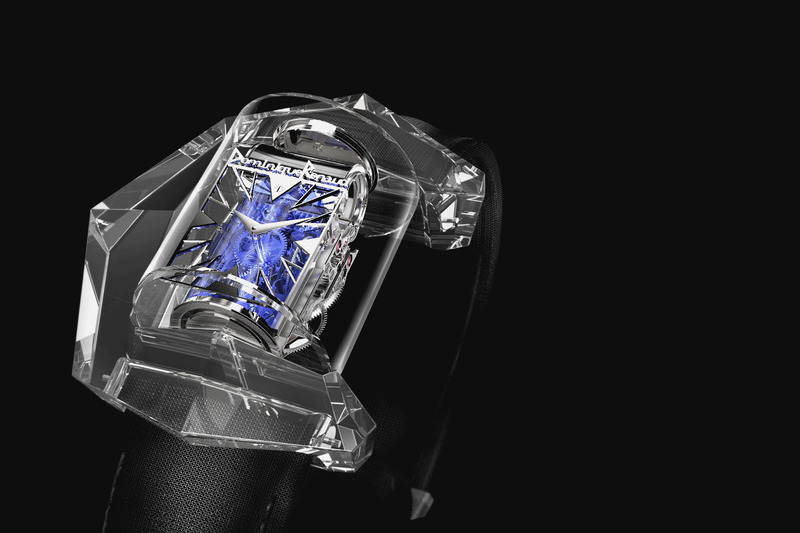 Therefore the wearer can rotate the ‘visio-module’, to read the time and admire every facet of the movement. Under the skeleton one-piece dial is a blued transparent nevralite subdial. The seconds are indicated via a second wheel perpendicular to the dial. The DR01 first watch is worn on a Barenia calf leather strap secured with a safety folding buckle. The DR01 project is a pioneering project, resolutely in a league of its own. 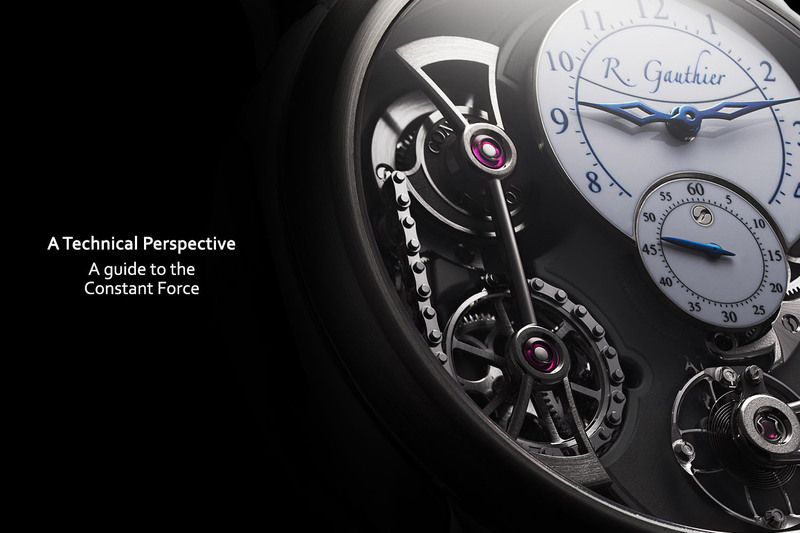 It is a true horological UFO both from technical (15 patents) and design standpoints. Its design is different from anything that has come before. From a conceptual and technical perspective, it is as interesting as it is highly complex and sophisticated. Embarking on such an experimental venture, and daring to explore unchartered territories is no small challenge. 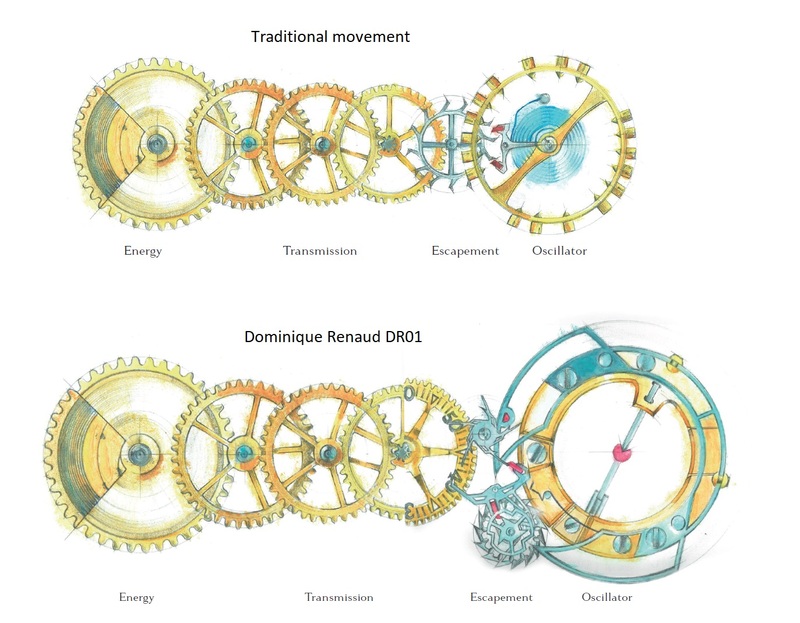 All the more so when you consider that Dominique Renaud does so only with the means available to traditional watchmakers (no silicon, DRIE, etc.) Plus, he operates within a small start-up founded with Luiggino Torrigiani (co-creator of Solar-impulse SA). We are looking forward to the next chapter of this story, so stay tuned. For more information, please email at info@dominiquerenaud.ch. Maybe clever, but that is some ugly casing structure. Might suit Rap artistes, I suppose. 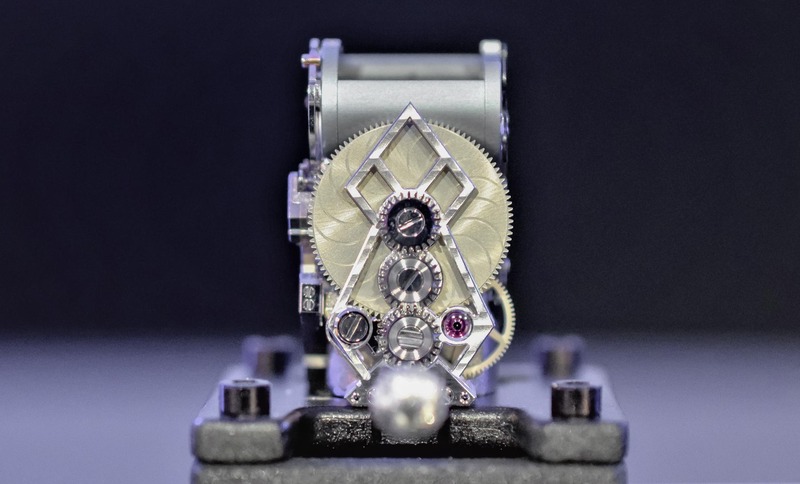 Bravo to Dominique for having completed an incredible piece of work which is an interesting and innovative step for the watchmaking industry ! The principles at the base of this new escapement are known and date back to the 18th century with the Duplex escapement from Leroy and the natural escapement from Breguet/co-axial from Daniels, but it is the combo of different ideas that allows to move forward. I wouldn’t comment on the aesthetics, as this is not the point. I guess that at CHF 1m the client may ask for another design ?